In my relatively brief residence in Wilmington I have noticed that there was not a lot going on in terms of anime related activities. This is why I took it upon myself to put on some events for all the anime fans around here. We have quite a lot of people who enjoy anime, given how many schools we have here. Not to mention that there is a strong film industry in our area to help that along. To my knowledge, Aniwave has been the first event series of its kind in Wilmington. However, I would like to note that this year has also seen the first Coastal Cosplay Picnic take place this August. The lack of such events is somewhat surprising given the aforementioned sizable fan-base for anime. I hope to try and do this again next year, with every intention of making it even better. 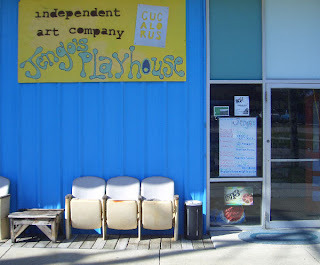 Our first event was the screening at Jengo's Playhouse, home to the annual Cucalorus Film Festival, on September 22. We provided Japanese drinks and snacks purchased at Tokyo Deli. Fanboy Comics gave away free manga, and had a prize drawing for a $50 gift certificate. Additional free items came from the good folks at AnimEigo, such as posters and promo DVDs of their newly licensed series Yawara! Our program started off with a showing of two shorts: Fata Morgana, by local film-maker Saben Kane, and Makoto Shinkai's She And Her Cat. Our features for this event were Voices of a Distant Star, followed by Cat Soup. All of these films were chosen for their high level of quality and mature artistic approach. I was glad to hear that those who came also appreciated the difference in our selection of anime. Having viewed these, local writer Joel Finsel felt that his understanding of anime "has grown from a misunderstood medium in [his] mind to a more legitimate form of expression that [he thinks] has a great deal of appeal to people of our generation." After the anime screening, we had another prize drawing for complete anime box sets generously provided by AnimEigo. The remastered Bubblegum Crisis box set went to Doug Sincox, while the Urusei Yatsura OVA collection went to Japanese exchange student Mayu Kazumatsu. The largest of the three, the complete series of You're Under Arrest totaling four separate box sets, was won by Sean Crowder. Overall attendence for this first event was admittedly lower than I had hoped, but we still had a great time. And since the number of attendees was smaller, there were enough t-shirts for everyone. Not to mention plenty of Pocky! So, big thanks go out to everyone who came to Jengo's in support of our first screening. On October 5 I held a tour at the Cameron Art Museum of the William Ivey Long costume exhibtion. The tour was intended for anime fans, and specifically for cosplay enthusiasts, and tour goers were encouraged to come in costume. 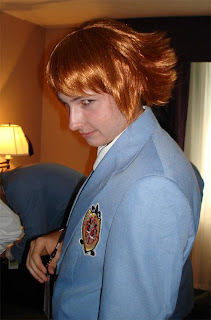 Senior member of the UNCW anime club Wesley Steffen, is shown above in his Ouran Host Club costume. The goal of doing this tour, besides simply getting to see some spectacular costumes by the premier Broadway costume designer today, was to demonstrate to cosplay fans the possibility of taking such an interest to the higher level of a career. Many cosplayers are probably not aware of such a career path being available to them. I had hoped to show that if costumes are something that someone is passionate enough about, they could pursue that further than the occasional anime convention. Again, turnout for this event wasn't high, yet this allowed for an intimate and informal group that was not without its merits. In part I think the price of admission for the tour was a factor. We all know that funds are limited when you are a student, which is something I will have to consider more seriously next time around. Ultimately, the tour was still quite enjoyable for me, and I think also for those who came for it. Besides, any chance to spread the word about anime and its related elements such as cosplay is a welcome opportunity. On November 2, we held our third and final event in the Aniwave series. 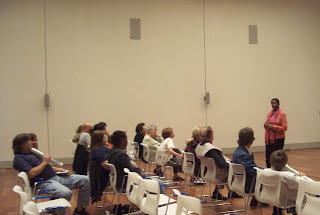 It was another anime screening, which took place at the Cameron Art Museum. We gave out additional posters, Yawara! DVDs, and had a drawing for more t-shirts. I wasn't sure what kind of turnout to expect given the previous two events, but I was pleasantly surprised. It appeared that we had at least double the attendees of our first screening. Interestingly enough, that night's attendees comprised a wide range of ages. This just goes to show you that anyone can enjoy good anime, no matter their age. Our first feature was Spring and Chaos, by Shoji Kawamori. It is based on the life of Kenji Miyazawa, a celebrated Japanese poet. Everyone seems to have enjoyed this film greatly, and some offered such thoughts to me after the showing. Anya Hill, president of the UNCW Anime Club, noted that Spring and Chaos contained a great number of cultural and historical references. This is surely a big part of the film's appeal. The second feature we screened was Blame! Based on the ten volume manga series by the same name, it is a darker collection of six short vignettes that are less accessible than most anime. Blame! has a definite independent art film flare, and probably left most of the audience scratching their heads. Its hard-edged science fiction feel offers more riddles and clues than clear plot structure, and should perhaps be experienced more as an aesthetic work. A big thank you goes out to Daphne Holmes, curator of public programs at the Cameron Art Museum, who played no small role in getting this part of Aniwave off the ground (pictured above). Overall, this was the most successful of our three events, with the best attendance. I must be honest in saying that I was hoping for a little more when our first two events came and went in terms of community support. But after our last event I do feel much better about having made Aniwave a reality in Wilmington. Though I curated it by myself, Aniwave would not have come together were it not for a number of very significant supporters in our community. I would like to extend a great thank you to our two sponsors. AnimEigo, a local anime production company, was incredibly generous in their donations for our events. Fanboy Comics, a local comic book store, was also a great supporter of these efforts. Without both of their donations, Aniwave would not have been possible. In addition, I want to thank Dan Brawley at the Independent Art Company for providing us with a venue for our first screening. As mentioned before, big thanks go to Daphne Holmes of the Cameron Art Museum for making our second screening possible in their space. Also, let us not forget those who made it possible for us to show the various anime in our lineup. Thanks go to Saben Kate for Fata Morgana, ADV Films for Voices of a Distant Star, Central Park Media for Cat Soup, Tokyopop for Spring and Chaos, and Media Blasters for Blame! And of course, all the creators of these anime, for their artistic vision and willingness to share it with the world! Last but not least, I would like to thank the UNCW Anime club for their patience and support. President Anya Hill, senior member Wesley Steffen, and member Lachelle Gatson donated their time distributing promotional material, and have come out to these events. Your support means a great deal to us!